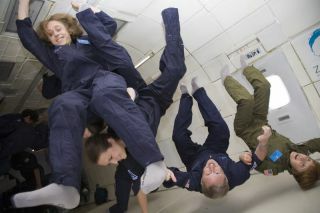 The Stern family of Colorado spent their Fourth of July holiday in weightlessness during a Zero Gravity Corporation flight on July 4, 2010. A company that makes some of the thrills of spaceflight more accessible to regular folks has hit a major milestone — 10 years of weightless flights. The Virginia-based Zero Gravity Corp. (Zero G) has now been flying customers on a specially modified Boeing 727 jet for a decade. The plane, known as G-Force One, flies in parabolic arcs that generate brief periods of weightlessness. Customers usually pay $4,950 for this experience, which can be exhilirating and nauseating at the same time. (G-Force One is sometimes referred to as a "vomit comet.") But the company is knocking 20 percent off the price for all future flights this year. "We've flown over 500 weightless flights with more than 12,000 clients, including notables like Stephen Hawking, James Cameron, Kate Upton, Halle Berry, Martha Stewart, Sharon & Ozzy Osbourne and Rob Dyrdek. It's been amazing!" Terese Brewster, ZERO-G president and chief operating officer, said in a statement. "In celebration of our 10-year anniversary, we want to say 'thank you' by discounting all remaining 2015 seats."